While I normally don't like to use flash in any outdoor photography, there is an exception. This shot was taken on a day in Okinawa, Japan where the skies went from blue to grey in a matter of seconds. 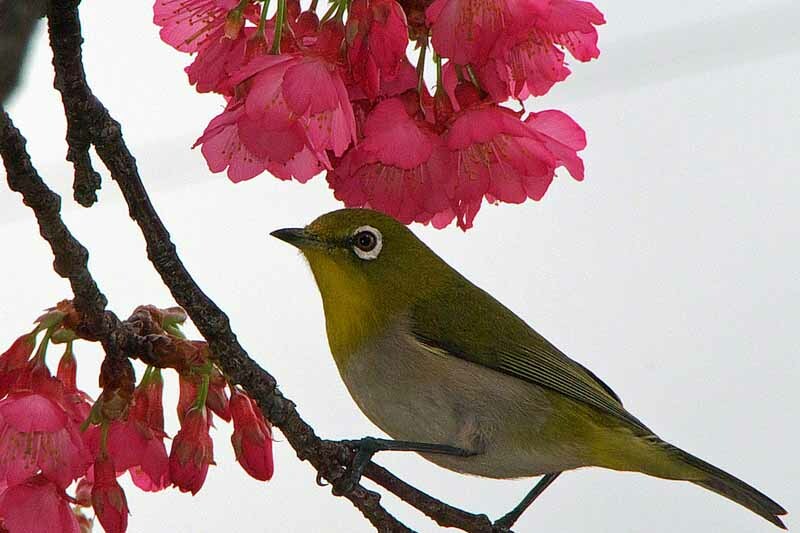 The bird, a Japanese White Eye landed among the Cherry blossoms and was in fairly horrible light. He wasn't much more than 6 feet away from me, standing under the tree. I removed my lens hood, popped up the camera flash, focused and fired. Camera flash doesn't phase wildlife. I was able to let the camera flash recharge and took several more shots of this bird before it flew away. Keep in mind, an on-camera flash isn't effective for shots more than 10-12 feet away from you. Flash photography is not my preferred method but, a shot made with flash on wildlife is better than going home with no shot at all ! Fantastic shot Mike, I've seen a few Scottish black eyes in my time but this is the first time I've witnessed a Japanese white eye. Huh? You've only seen a few black eyes? Ya need to get out more often then! Some awesome wildlife photography on your site, too. Glad to share a link with you and I'll be back to visit. The Son-in-Law Came Thru: Yah Hu Hu Hu !